Sunday 6 September 2015. 18:30. UK Book launch of ‘Baghdadian Jews of Bombay- Their life and achievements: A personal and historical account’ by Rachel Manasseh, born in India in 1920 of Baghdadian parents. 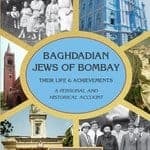 The book tells the exciting story of the 200-year sojourn of the Baghdadian Jewish Community in the cosmopolitan city of Bombay (today’s Mumbai), India. From their early beginnings, in the eighteenth and centuries, they left their legacy in the city, with beneficent contributions and involvement in civic life and made their mark nationally in Indian film. Their gradual dispersal followed Indian Independence, to English-speaking countries and to the newly established State of Israel. Today, the synagogues with clock towers and steeples, the ‘Queen’s necklace’ at Marine Drive, the Gateway of India, Apollo Bunder, the Prince of Wales Museum, Cuffe Parade, Flora Fountain, and Crawford Market are landmarks which still remain – albeit renamed in some cases – along with a small nucleus of the original community.Tikun – Temple Fortune House, 1117 Finchley Rd, City of London, Temple Fortune, Greater London NW11 0QB. £10. Contact Spiro Ark: 0207 7944 655 or email info@harif.org.